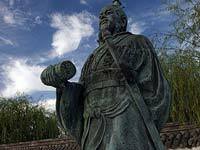 Sun Tzu is more than just a famous author from Chinese antiquity. He was also a legend of military history. Sun Tzu was a great general who had the foresight to log his thoughts on military strategy in the seminal classic The Art of War. Sun Tzu lived roughly 550 to 500 years before Christ. Very little has been documented about his life and many records from the era are lost. Scholars assume he was a general who served under King Helu of Wu. However, much about Sun Tzu’s life simply has been lost to history. There are even conflicting opinions as to where he may have been born. Some sources list him as being born in Wu while other sources indicate his birth was in Qi. Again, he did serve the King of Wu quite effectively. Sun Tzu’s strategies were considered among the greatest of his era. This is why he was encouraged to write down his thoughts for future posterity. There are, of course, several mythical tales about his life. While these tales can be interesting to read, they are more akin to folklore and do not seriously tell us much about the life of the legendary general. Regarding his legendary work, assumptions exist that the material was actually completed based on a random collection of his notes. In other words, the finished version of The Art of War was completed during the Warring States era, which lasted for about 200 years. Many different editors could have contributed to the final version of the work. Interestingly, The Art of War was intended to remain a secret text. After all, it was a book on the subject of military strategy. Revealing what was in its pages would not have been beneficial to the Chinese military that based its battle plans on the common sense generalities presented in the work. Some might wonder why such a common sense work was deemed anything secretive. Many of the concepts in the work were based on a lifetime of military experience. Also, Sun Tzu, unlike other generals, was able to articulate his thoughts into a logical learning progression. This is what makes the book so valuable. It can effectively convey the information to those reading it. More importantly, the material in the book can be used outside of the box of military planning and strategy. The Art of War eventually found its way to the western world in translated versions in the early 20th century. The material in the book has frequently been applied in the business world and in self-improvement. Sun Tzu is remembered as a master military strategist. However, he was influenced many outside of the military with his work. As such, to call him a master military strategist might be limited moniker since his advice can be enormously helpful in many unique environments.